Conceived by Chris Grey and written to get you thinking, the “Very Short, Fairly Interesting and Reasonably Cheap” series offers an informal and accessible yet sophisticated and critical overview of what you find in conventional textbooks. 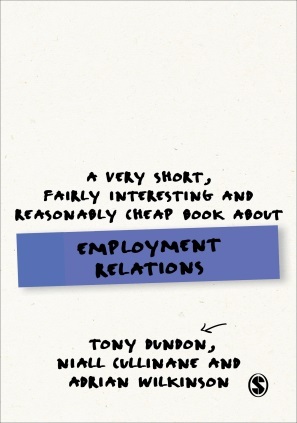 In Employment Relations the authors translate years of experience, with the help of interesting vignettes, real life examples and connections with popular culture, into a critical understanding of the topic that brings the field to life. An excellent supplementary text for Employment Relations and HRM students or anyone interested in a short, succinct book on the subject of Employment Relations. An accessible introduction to the interdisciplinary field of employment relations that also sheds light on broader social and economic dilemmas we face. The authors are provocative - hitting the important tensions and contradictions facing working people today - with rich anecdotes from popular media and culture that bring the underlying academic research to life.